Kids Digital Camera: 1.77\" LCD screen, HD 1080P/30fps videos and 5MP( 2592x1944 ) photos, built-in 6 different Frame Photo Modes, 7 Color Video Modes and mini games, explore your kids\' creativity, best birthday holiday christmas gift for your children. 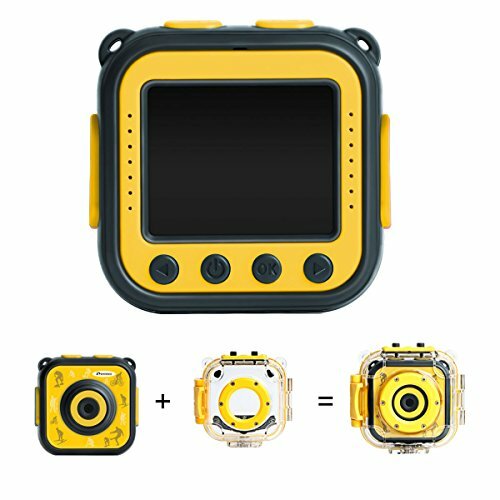 Underwater Camera: Put the kids camera in the durable waterproof case to use underwater up to 33 feet! Unique Design: Original design and manufacture by Prograce Team, We offer high quality ,environment-friendly, non-toxic material product to protect our kids\' health. Multi-function: kids video camera comes with 2 mounts which allows the video camera to be attached to any flat surface (skateboards, helmets) and bikes. It is waterproof, dustproof, anti-shock and anti-fall, easy and convinent to carry it everywhere you go. Toy camera has a rechargeable Li-ion battery with continuous photo-taking and recording time of 1.5 hours, action camera has a micro memory card slot, max support Class 10 32GB SD card, format your SD card(not included) first before using, make sure the format is FAT32.